Watching sushi chefs waive their wands over fish and creating pure magic is the culinary version of watching David Copperfield. Where else is food so artistic, yet so addicting to devour? 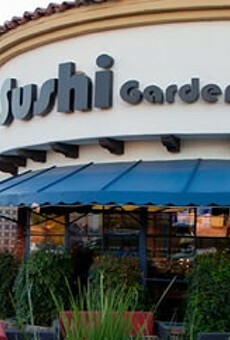 Sushi Garden has the complete sushi experience. You can down $4 sake bombs or half-off beer at happy hour, watch the UA game on their big screens, make the lunch buffet disappear or just overindulge yourself in fresh seafood, straight from the master's hands. They have creative and unique rolls as well as just flat out excellent sashimi. The staff is always fun and accommodating and you cannot beat the atmosphere.